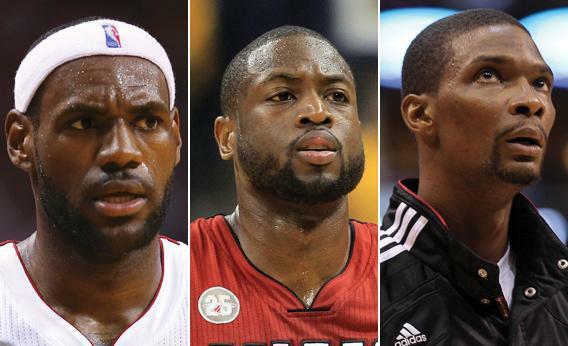 NBA Finals 2013: The Miami Heat are at once David and Goliath. The Miami Heat are at once David and Goliath. On May 28, ESPN.com’s Tom Haberstroh asked if the 2012–2013 Miami Heat were the best team ever. The Heat had won 47 of their previous 51, and hadn’t lost back-to-back games since early January. With a 2–1 lead over the Pacers in the Eastern Conference Finals, they were in the midst of one of the most impressive postseason runs ever. Maybe they weren’t the greatest collection of talent in history, but they weren’t far off from the best versions of Jordan’s Bulls, Magic’s Lakers, and Bird’s Celtics. The Heat beat the Pacers in Game 7 by 23 points. Crisis averted, until the next time Miami loses a game. The Heat are the NBA’s Goliath, at once indomitable and in danger of being felled by each pebble that gets flung at their noggin. Every victory is inevitable, every defeat apocalyptic. In large part, James did this to himself and to his teammates, raising the bar for championship success so high during the Big 3’s 2010 welcome party—“not two, not three, not four, not five, not six, not seven”—that even a fistful of rings won’t be enough to clear it. But the recent chatter about the crumbling of the Heat’s not-yet dynasty also stems from another fateful (if less capitalized) decision. Last year, Miami coach Erik Spoelstra made the radical move of playing without a true center. That strategy, which took advantage of the Heat’s athleticism and LeBron’s versatility, helped Miami blow past the Thunder to win the NBA title. At the same time, that move—as well as several key signings in free agency—put the Heat in the curious position of pairing Goliath’s reputation with David’s stature. The Miami Heat are the big, bad bullies of the NBA, a team that also happens to get pushed around by the league’s biggest, baddest players. Never has such a strong team willingly handicapped itself with such a glaring weakness. Given the league’s salary cap strictures, no NBA franchise has the luxury of playing with a fully modular roster. For coaches and general managers, lineup construction and deployment amounts to placing a season-long wager on which collection of players will lead it to championship glory. The Oklahoma City Thunder have bet over the last few seasons that a roster featuring the massively expensive, massively expansive Kendrick Perkins—as well as, this season, a roster that included Serge Ibaka rather than James Harden—would help them maraud past any franchise with a dominant center. That bet hasn’t paid off: Perkins didn’t help at all against the Heat in the 2012 Finals, and his presence was pretty much moot this year after Russell Westbrook hurt his knee. Miami’s decision to go small—their salvation against the Thunder in 2012—is what made the Heat appear on the verge of an on-court breakdown in the Eastern Conference Finals. Previous small-ball teams, most notably Don Nelson’s Warriors, consciously sacrificed defense for offense, taking advantage of their quickness to score a whole bunch of points while getting taken advantage of on the other end of the floor. But Miami hasn’t typically sacrificed all that much. This year, the Heat ranked No. 7 in the NBA in defensive efficiency, making up for its lack of height by trapping aggressively and forcing turnovers. The Heat are always scrambling, madly running around the court to cover up for their self-imposed deficiency. And it works. Well, it usually works. In the Eastern Conference Finals, the brawny Pacers actually bettered their offensive efficiency from the regular season, improving from 101.6 to 103.2 points per 100 possessions. Roy Hibbert stomped all over the Heat’s little big men (as well as reasonably large big man Chris Andersen), averaging 22 points and 10 rebounds. And Indiana obliterated Miami on the boards, grabbing 55 percent of the series’ missed shots, a mark that would’ve easily led the NBA this season. The matchup with the Pacers revealed that, even with LeBron James on the roster, small ball can be a tenuous technique—a high-variance strategy that’s prone to the occasional enormous failure. Double teams often lead to turnovers, which create easy baskets. Get enough of those, and you win going away. But if your rotations are late, and your swipes at the ball are too slow, then you give up easy baskets. In this case, Wade’s weakened state and Bosh’s errant shooting made the Heat look, at times, like every other undersized team. The Heat’s struggles against the Pacers were a necessary consequence of the small-ball approach. Miami’s consistent regular-season greatness belied the fact that, when they face the league’s best and biggest teams, they’ll occasionally look terrible. This was less an identity crisis than a reality check: The Heat happened to face the one team that was best designed to take advantage of their roster’s weaknesses. Now that they’ve survived the Pacers, past performance does not have much bearing on future results. Though San Antonio has a big frontcourt like Indiana, the Spurs are a different team, with different matchups, ones the Heat should be able to exploit. The best way to stave off an identity crisis is to avoid having an ironclad identity. Against the behemoth Pacers, Spoelstra made the concession of relegating the 6-foot-8 Battier to towel duty. But as Grantland’s indispensable Zach Lowe explains, Battier—whose ability to defend power forwards and drain corner threes allowed the Heat to go small in the first place—should be more playable against San Antonio, whose Tiago Splitter is less of an offensive threat than Indiana’s David West. So long as Dwyane Wade’s knee doesn’t explode, it looks like Miami’s bet will pay off. After all, the Spurs have just one player, Kawhi Leonard, who has any hope of corralling LeBron James—and that hope is minimal when the NBA’s best player moves to the low block. In the end, for all the talk of small ball, this is the most important roster advantage the Heat have in every series: They have LeBron, and the other team doesn’t.